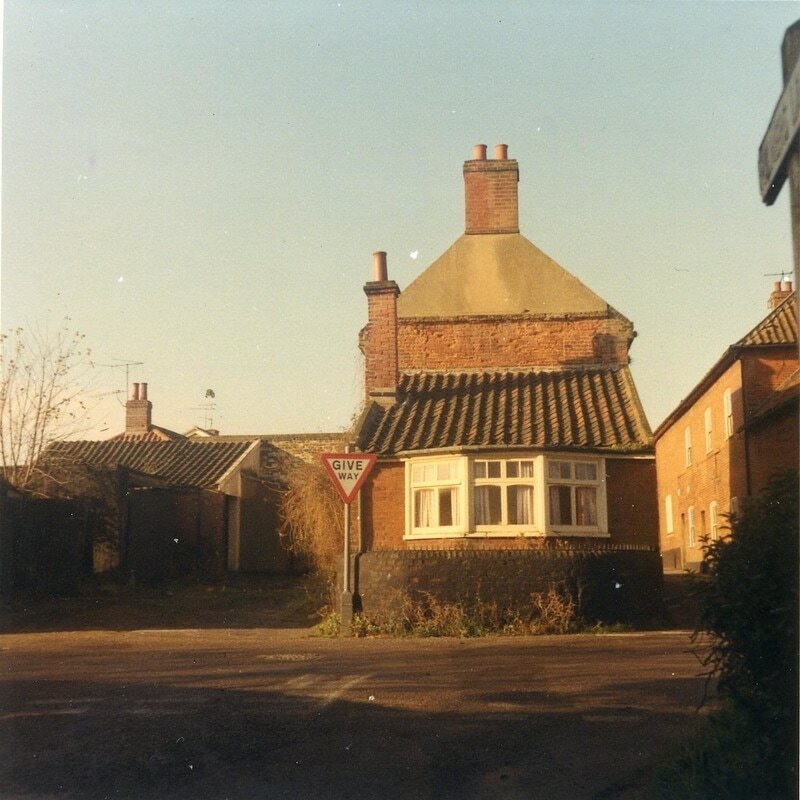 ​All photographs courtesy of Aylsham Town Archive and available to view or purchase in the Heritage Centre. The Buttlands - The Buttlands/Buttslands were used to enable every man and boy to practice archery regularly. This was a requirement of an act of parliament passed in the reign of Henry VIII. The land used for this practise had to be one furlong. 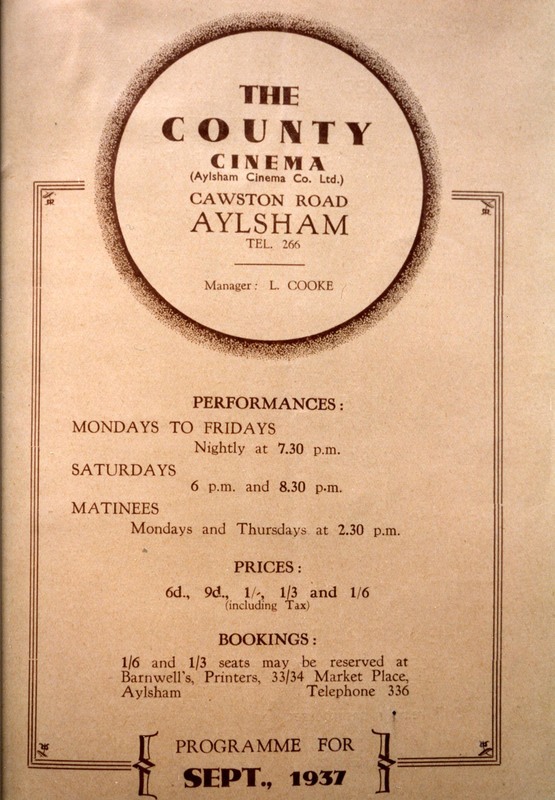 The County Cinema, at the bottom of Cawston Road was opened in September 1937 by Lady Walpole. 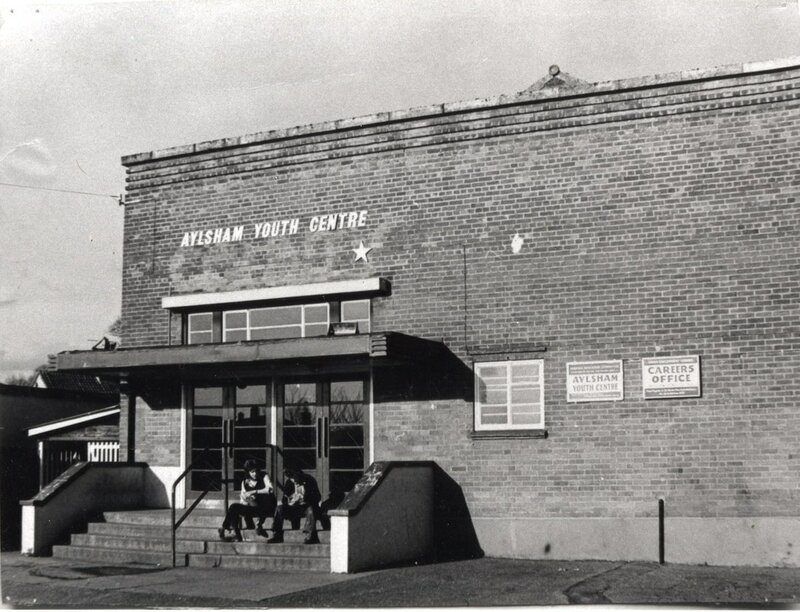 It was agreed by the Education Committee in January 1962 to purchase County Cinema to convert this to a Youth Centre. The new centre was opened on September 30th 1963. Ether ... Joseph Clover was born on 28 February 1825 in Aylsham. He invented a portable ether inhaler in 1877. It remained in use, modified in various ways, well into the 20th century. He was one of the foremost anaesthetists in Victorian England and a major influence in the speciality of anaesthesia. Edward VII ... Preparations for celebrations of the coronation to be held in the Market Place in 1902 were at an advanced stage when news was received that the coronation was postponed as the king was undergoing a surgical operation. An emergency meeting of the committee was held on 24th June as which “it was unanimously resolved that all festivities be abandoned.” Although the main celebrations were postponed, there were still some celebrations in the town on June 26th. The school children gave a display of physical drill and maypole dancing in the market place before they were presented with coronation mugs and medals by Mr Christmas Stapleton. French Twinning - Aylsham in Norfolk was twinned with La Chaussee-Saint-Victor in Loir-et-Cher, France, at two ceremonies, one on August 28th 2000 at the Aylsham Show, and one at the gymnase (gymnasium) of La Chaussee-Saint-Victor on October 28th 2000. Goulder - The recreation Ground and Pavilion in Aylsham were given to the town as a memorial to the Goulder brothers who were killed in WW1. Robert Christopher Goulder was killed in the German Trenches north of Carnoy. Clare Horsley Goulder died on 31st October from a gunshot wound to the leg sustained at Carnoy (on the Somme) on July 1st 1916. Sergeant John Lee Goulder, was killed in action at Sulva Bay on August 12th 1915. Henry Page - One of the iconic buildings in the Market Place was The North Norfolk Supply Stores – otherwise known as “Pages”. It was owned by Henry Page. The giant lettering dominated the Market Square. 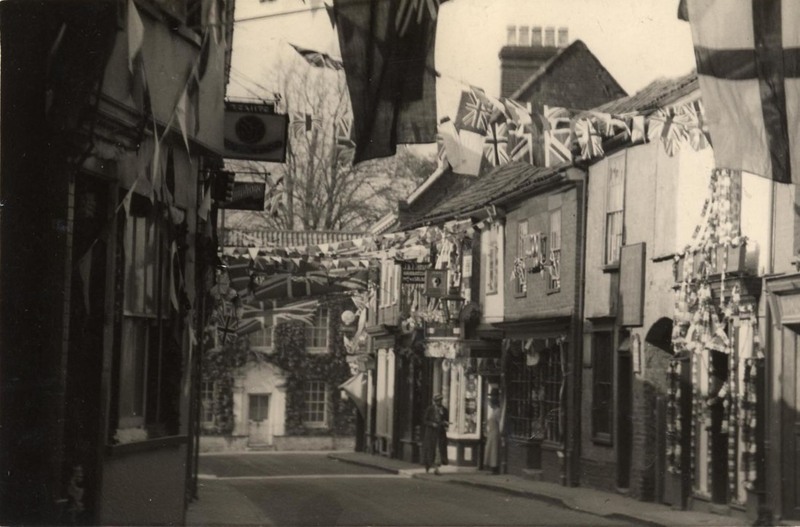 Inns and Pubs - There have been at least 21 Inns and Public Houses in Aylsham, five of which were on Red Lion Street. The Red Lion was situated in Red Lion Street from the 1700s until it closed in the 1970s. The bracket from the pub sign can still be seen today. The photograph of Red Lion street clearly shows the Red Lion sign. The Swan Inn was located at the corner of Mill Road and Hungate Street. It became an Inn in 1620. The pub had its own well, which supplied the inn with water. Although it was a listed building, it was demolished in 1969. The Anchor Inn (Now Bridge House) began trading as a pub in 1781 following an increase in trade from the navigation. Lots more information about pubs and inns in Aylsham can be found in Elizabeth Gale's book "Aylsham Inns and Public Houses"
John of Gaunt - After the Norman Conquest the Manor of Aylsham was held by the crown and passed to John of Gaunt in 1372. He was able to provide money to the villagers of Aylsham for the building of a large new church. The church was dedicated to St. Michael and All Angels. Joints - St Michael's hospital was a centre of excellence for Rheumatology. Pioneering operations for joint replacements were also carried out here. ...Kenneth McKee was a consultant at the hospital. He was the most famous of Norwich’s Orthopaedic surgeons, because of his major contributions to joint replacement surgery and because he was a pioneer of the total hip replacement. He invented artificial knee and elbow joints. Kathleen Starling - An internationally known Opera singer lived in Aylsham. 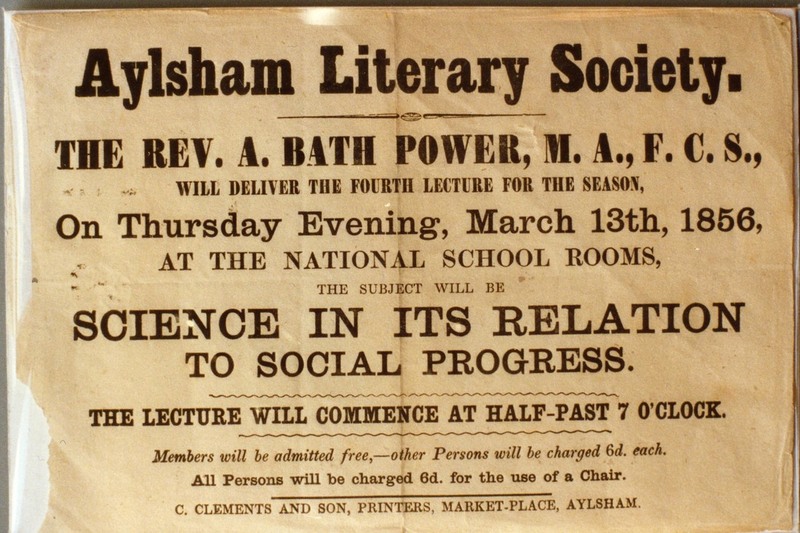 Literary Society - 1937 saw the end of the Aylsham Literary Society. It was founded in 1848 and had a library and a reading room in the town hall. 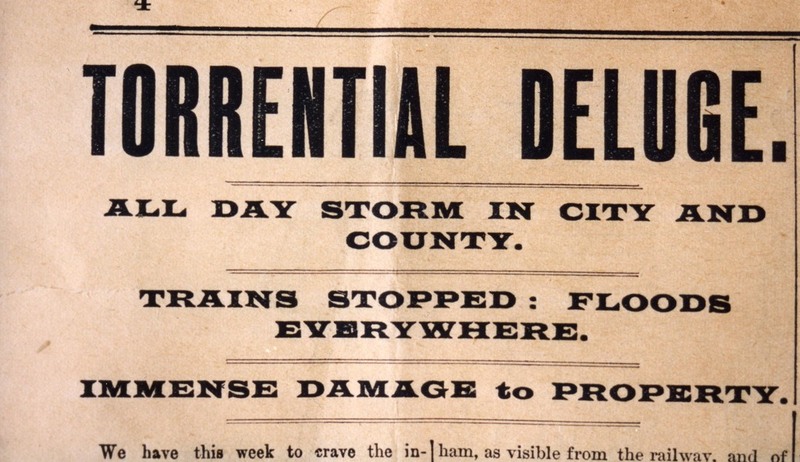 Books could be borrowed, and newspapers and periodicals were available to read. Silence was preserved, but sedate games such as chess were permitted! Linen - Fabric made in Aylsham was known as “Aylsham Web”, “Cloth of Aylsham” or “Aylsham Linen. It was a well-known cloth of excellent quality that was used all over England and France. In 1323 it was used for making pillows for Edward II’s bed. It was also used by the Royal household for lining armour, covering cushions and making pennons (a type of flag) bearing the arms of St George. In 1333 more of this cloth was ordered by the king to make hobby horses for games and jousting. ​Masque of Anne Boleyn - The Masque of Anne Boleyn, written by Walter Nugent Monk, was staged at Blickling Hall in 1909, 1925 and 1938. The performances were used to fund repairs to Erpingham Church tower, Aylsham School and Aylsham church. Many records and memorabilia still exist from the 1938 production. Queen Mary attended one of the afternoon performances. Navigation - In 1773 an act of parliament was passed to allow the construction of channels and locks to make the River Bure navigable between Aylsham and Coltishall. The Bure from Colitshall already provided a route for trade to and from Yarmouth, but the stretch between Aylsham and Coltishall was not suitable for the passage of large vessels. It needed to be modified by canals and locks. The Aylsham Navigation was opened... in 1779. • Building five new locks. The work was supervised by a surveyor called Henry Augustus Biedermann, who was born in Germany before moving to England. He drew the map of the Navigation in 1772. 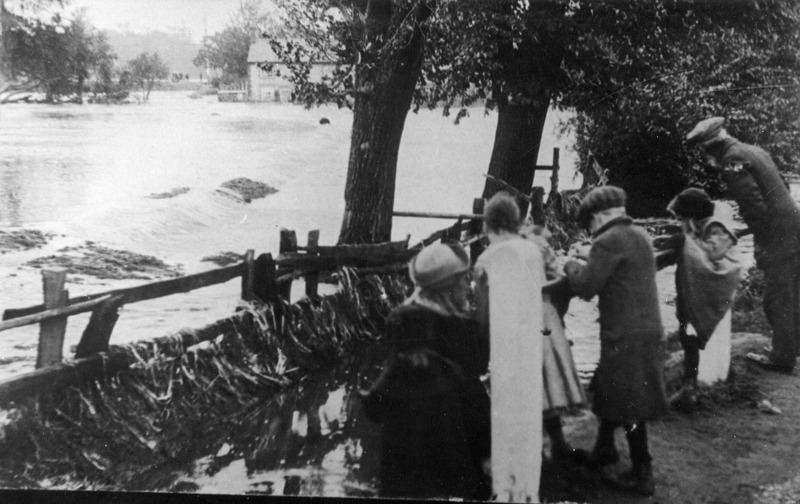 Torrential rain caused a huge flood in 1912 which destroyed all the locks on the Bure navigation. The 29th of May was observed as a public holiday in the days when regular holidays for workers were unknown. On this day all the different clubs and societies used to meet at their respective lodge rooms attached to various public houses at about 10 am. They joined together in the Market Place to form a colourful procession which paraded through the town before attending a special service in the parish church. After church they paraded through the town again and then dispersed to their respective clubrooms for dinner which was at about 1 p.m. The Friendly societies who were involved with these parades gradually declined and by 1911 the celebrations had come to an end. The Pump - The John Soame Memorial Pump is a distinctive feature of the town. Until 1911 townsfolk drew their water from private wells which carried the risk of contamination. The John Soame pump was offered to the town as a memorial to John Soame. John Soame was a councillor in Aylsham in 1894. His nephew, John Soame Austin was a wealthy financier who was born in Aylsham. He offered to provide a public well, pump and shelter for the town in his Uncle's memory. The pump was officially opened on 29th May 1913. Piped water supply finally reached the town in 1938. Queen Elizabeth - Tuesday 2nd June - Coronation day celebrations in Aylsham. Mr J. B Postle installed a television set in the church, hoping to use a temporary aerial on the tower to gain good enough reception for the public to view the ceremony. Unfortunately, the weather was cloudy and wet, so this was not possible. However, a sound broadcast was well received. In the afternoon, sports took place on the Rec. There was to be an outside tea for school children and older residents, but this was moved inside to the Town Hall. At 6.30 a fancy dress parade took place on the Buttsland and was judged on the Rec. A new pair of ornamental iron gates were formally opened at the Rec to commemorate the coronation. In the evening, dancing took place in the Town Hall. Many events took place throughout the week, including dances, whist drives and bowls matches. There was also a chance to see the Buttsland used for its original purpose, with a display of archery. Repton. The graveyard of St Michael's church is also the final resting place of Humphry Repton, the famous landscape gardener, who chose to be buried in a small walled garden near the south chancel door. Railways. Aylsham had two railway stations known as Aylsham South and Aylsham North. The first railway into Aylsham was an extension of the East Norfolk Railway from Wroxham to County School. The station at Aylsham (which was known initially as “The Great Eastern”) was opened as trains began to run through to Norwich on 1st January 1880. On the 27th September 1948, the station was officially renamed “Aylsham South”. The line closed to passenger traffic in 1952 but remained open to freight traffic until much later. The station was used for freight trains carrying concrete beans from the concrete works in Lenwade. The concrete was used mainly for bridge construction. Eventually this trade decreased and the tracks were lifted during 1984 to make way for Bure Valley Railway. The East and Midland railway in Millgate became the Midland and Great Northern Railway and was known as Aylsham North. It opened in 1883. The line had through trains to the Midlands and also through to Great Yarmouth. The station handled passenger and freight traffic. Sugar beet was the mainstay of the winter freight traffic in later years. The line closed in February 1959 and the station was demolished. It is now part of the Weaver’s Way. Aylsham Show - The first Aylsham Grand Fete and Gymkhana took place on, June 10th 1946, on the Recreation Ground, despite the typical... bank holiday rain. By 1949 the show was attracting 4,000 visitors and was outgrowing the Recreation Ground. In 1950 the show events spanned a week, with the show and gymkhana on the Monday, Children’s sports on the Wednesday and a Dance on the Friday. Programmes were numbered and entered into prize draw to win the first prize of a pig! In 1954 the show was offered an opportunity to expand and the show moved to Blickling Hall. During the early 1970s it moved to Wolterton Park, returning to Blickling Hall once again in 1975 where it continues to be held each year. Town Crier. There was a Town Crier or Bellman in Aylsham who “cried” announcements around the town. The most common announcement was about lost property, but extracts from the Town Crier’s book in 1923 show that announcements about entertainments were also made. ​Town Hall - The Town Hall in the Market square was built in 1856/7. The Hall was built by the Aylsham Town Hall Company as a corn hall. The building contained desks and stands for corn merchants. There was a reading room containing the principle newspapers and periodicals. It also had an 800 volume library. The coming of the railways meant that the Town Hall was no longer useful as a corn hall. The building was still popular as a meeting place however, and a local solicitor, William Forster, bought it. This photograph shows the extension that he built which gave office accommodation and a stage in the main hall. After Forster’s death in 1906, the town council purchased the town hall following a vote to agree that the buildings could be purchased with a loan of £1400. Aylsham Union Workhouse. Aylsham Union Workhouse (latterly St Michael's hospital) was built in 1849 and was designed by the renowned architect William J Donthorn, a founder member of the Royal Institute of British Architects (RIBA). The Workhouse cost £12,000 to build (approx. 1.4 million in today’s terms) and was designed to house over 600 inmates, although it rarely housed more than 150. Many people were supported by the workhouse through “out-relief” which provided support for those “deserving poor” who could survive without needing to live in the workhouse itself. Poor people living in the workhouse were called inmates. They were given uniforms, classified into one of seven groups or classes and made to work. Personal possessions were taken away, and families were separated. Able bodied inmates were expected to work to earn their keep. Oakum picking was a common job. Inmates had to handle old rope, which was covered with tar, and tear it apart with their hands. They used a spike to tear the rope apart, hence the workhouse became known as “The Spike”. Victoria. Celebrations to mark Queen Victoria’s Coronation, Golden and Diamond Jubilees were celebrated with a huge events being held in the square. 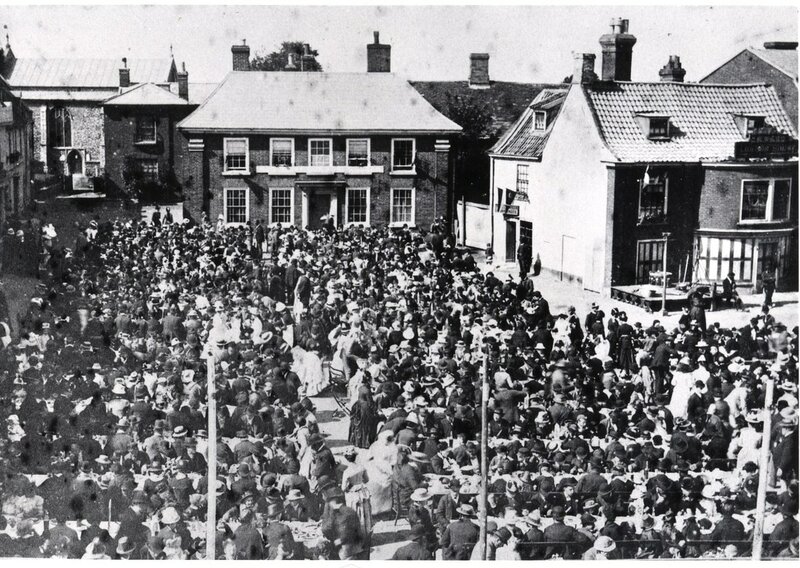 A huge dinner took place in the Market Place for the Golden Jubilee in 1887. At 1.30 pm a procession was formed in the vicarage garden and marched, headed by the volunteers’ band, to church where a thanksgiving service was held. At 3 p.m. seventeen hundred people dined in the market place. Admission to places at table was by ticket and diners had to bring their own “knife, fork, plate, and mug or glass.” Mr. William Forster, the chairman, proposed the toast after dinner, and at 6 p.m. sports were held in his grounds at Blickling Lodge, followed by dancing to the volunteers’ band and singing. To conclude the festivities there was a bonfire and display of fireworks. A time capsule containing information about the event was discovered in the town and all the documents are in the Town Archive. War Memorial - The Cottage Hospital, or to use its full title “The Aylsham And District War Memorial Cottage Hospital” opened in 1956. It was Dr. Holman who first proposed that a War Memorial Cottage Hospital should be built in Aylsham. Money was raised to build and equip the cottage hospital by residents of the local area, to the total of £2,791. Subscriptions from the Aylsham and District Ambulance Fund Committee £1,278, the Aylsham Nurse Fund Committee £29 and the Aylsham Welfare Committee £518 added to the fund. Enough funds were secured to provide Aylsham with its own eleven-bedded Cottage Hospital as a living war memorial. The cottage hospital made it possible for GPs to treat local patients under hospital conditions. It was also a place where patients could recuperate after treatment at another hospital, to enable them to be closer to home. Xcavations (!) - Roman finds at Woodgate Nursery led to investigations as to what could have been on this site in Roman times. Following a trial trench in December 2015, the first community dig, led by Britannia Archaeology, followed in August 2016. A fantastic couple of weeks of digging, cleaning and sorting uncovered Roman Kilns and 100s of finds. Some of these finds are on display in the Heritage Centre to view and handle. Youth Club - The first meeting of the youth club was held in 1950 in the Scout Hut in Petersons lane. The club moved in 1953 to the Drill Hall, and met there until 1957. Zulu. At one time, there were about 26 wherries transporting goods between Aylsham and Great Yarmouth. A number of wherries were built in Aylsham. A wherry called Zulu was the last to sail from Great Yarmouth. Because of the floods of 1912, all the locks on the Bure navigation had been destroyed and Zulu became stranded at Buxton. She had to be hoisted across the road by winch.